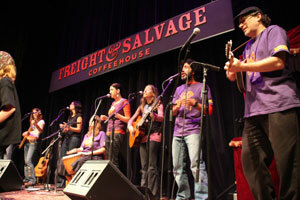 Ta-dah: we're excited to introduce a new Saturday daytime kids' series at the Freight! Featuring some of the Bay Area's most beloved performers, the Patchwork Series is curated and MC'd by the fabulous Sarita Pockell and Melita Doostan, of Octopretzel fame. Today's debut edition guarantees a super fun sing-along, dance-along time for one and all (especially kids aged 0-7 and their families), with the spotlight on Octopretzel, the Bubble Lady, and Alphabet Rockers! If you haven't heard Octopretzel yet, you are in for a treat! With their four-part harmonies and roots-music instrumentation, Octopretzel knows how to throw a wild dance party replete with spontaneous kiddie mosh-pits, funky puppets, and catchy tunes. The band has become a favorite among families in the San Francisco Bay Area and is excited to present music from it's brand new album "If I Were a Song..."
The Bubble Lady (also known as Rebecca Nile), partnering with the amazing musicianship of Charles Moselle, enthralls audiences of all ages as she magically transports them to Bubble Land. Rebecca and Charles weave a tapestry of original stories and song to create an imaginative world filled with incredible bubble adventures. 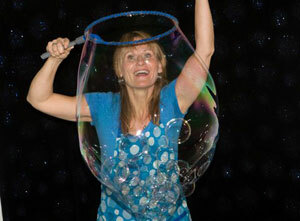 From itty-bitty bubbles to catch in the air to enormous bubbles big enough to envelop an entire kid in a glimmering, rainbow-hued world, the Bubble Lady presents a squeaky clean set of silly, exciting, and visually fascinating soap-based fun. Harvard graduate and professional singer Kaitlin McGaw and 4 Non Blondes drummer/author/music teacher Dawn Richardson joined together to create Alphabet Rockers in 2007, aiming to create cutting-edge shared learning entertainment for preschoolers and early elementary school kids. Alphabet Rockers appeals with its high-energy sound, combining hip hop, education, dancing, and singing for an unconventional, interactive, show for the whole family.